Okay so I am not completely sure if this is my favorite meal ever… but it has to be in the top 3. I made this the other night after going to the grocery store kind of hungry and well, I picked out my favorite foods. Portobello mushrooms, baby bok choy, and yams were the highlight of this meal. I love making portobello mushroom steaks because they are so versatile; you can get creative with cooking techniques and what to seasoning you’d like to use. Since I had the baby bok choy I decided to go a little more Asian themed, but I have also made this dish in the winter with cooking wine and making a thick mushroom gravy to go over the top. Since it is Spring and lighter foods are in order, the gravy was just from the sauted onion and garlic, liquid aminos and celery to make a nice broth that I poured over the top. Another reason I love this recipe is it gets converts: when I first met my husband he told me the two foods that he didn’t like were mushrooms and yams and every time I make this dish he freaks out about how amazing it is!!! Add a couple tablespoons olive oil to large sauce pan to saute onion and garlic lightly. Then add a couple cups of water with the liquid aminos and mushrooms. Cover and steam for 5 minutes. Then add baby bok choy and celery and steam for another 3-5 minutes depending on how well you like the greens cooked. The gravy is the liquid from all the steamed and sauteed veggies… you can thicken it if you like or serve as is. I love making a gravy with pumpkin seeds, but you can use walnuts, cashews, hemp seeds, sunflower seeds… any seed of your choice. Check out a recipe for Pumpkin Seed Gravy in part of my Fall Cooking Class Series. Cube a large yam and boil in separate pot while cooking up the mushroom steaks so everything is done at the same time. You can just mash them up or add Earth Balance Vegan Butter to make them even creamier. Remember be creative: use different greens, try other seasonings… have fun experimenting. When everything is done I like to pour the gravy over the top of it all and enjoy this amazing dish!!! ← My Ideal Day… Yoga, Buckwheat Pancakes, Green Smoothies and More!!! Sweet! Let me know what you think… I hope you like it as much as I do! This is also one of my favorite meals ever!!! So good. Sweet! Let me know what you think. 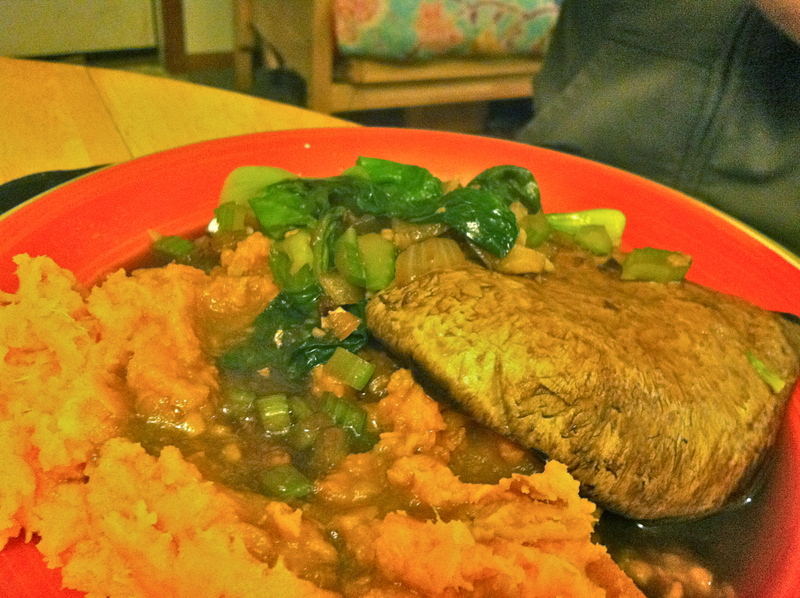 Portobello steaks with mashed sweet potatoes! I have to try this! It’s so good… when I first met Dan he claimed not to like mushrooms or yams, and he loves them now so much!! !